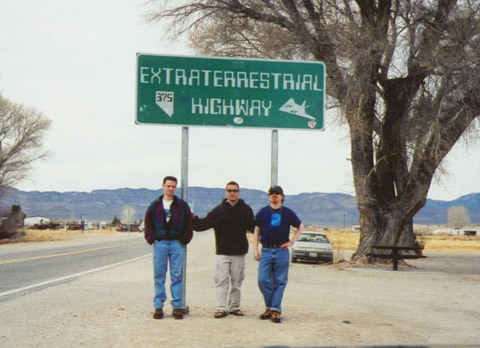 In March 2002, three friends (Carl Cunningham, Adam Parr, and John Klinger) debarked on a memorable trip. During the span of 8 days, they visited Las Vegas; Area 51/Rachel, Nevada; Death Valley; Fresno, CA; Modesto, CA; San Francisco; and Los Angeles. Monday, March 11th 2002 marked one of the highlights of this epic trip. 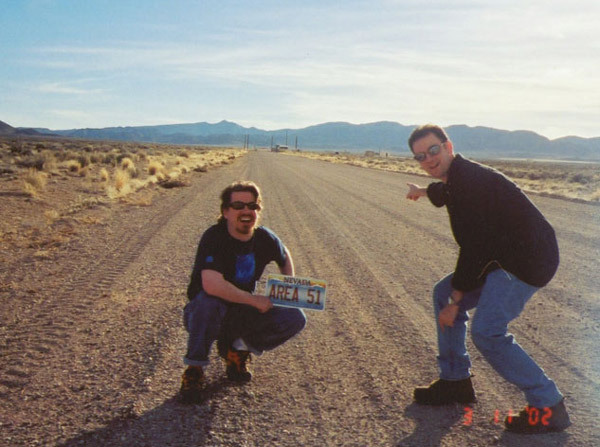 It was the trek to legendary Area 51. This is their story. We left our hotel (the Luxor) at about 8:00 in the morning, stopping for a quick breakfast buffet first. The drive from The Las Vegas Strip to the Area 51/Rachel area was actually quite pleasant and enjoyable. Heading North on Highway 93 (the longest part of the trip) we noticed a lot of really great jet fighter and maneuvers and dog-fighting in the sky. This is when we remembered that we were lucky enough to be visiting during one the Air Force's scheduled "Red Flag" exercises. Dog-fighting and all kinds of air practices from the Nellis Air Range provided a unique air show along the way. It took just over 2 hours to reach Groom Lake Road and the main border to the base, but there were a couple of notable stops along the way. First we stopped at the now infamous "Extraterrestrial Highway" sign near Ash Springs at the intersection of Highways 93, 318, & 375 (The E.T. Highway itself). The sign sits in a small area between Hwy 318/375 and there were two parked cars sitting quietly underneath the large trees. We've heard that Area 51 workers actually park their cars here and take unmarked buses to the base. Probably true. We noticed that the cars didn't seem to have been there very long. Also, at the intersection of Hwy 93 & 318 sits the ruins of what is reportedly a long abandoned casino. In its parking lot was an amusing billboard, advertising "Alien Fresh Jerky". Also just down the road from the ET Highway sign was an advertising sign for "The Little A'Le'Inn" in Rachel, letting us know we were only 40 miles or so away. After a few minutes of taking photos and sight-seeing at the sign area, we hopped back in our rental car and began the 20+ mile drive to the beginning of Groom Lake Road along the E.T. Highway. During the drive, we felt the need to just stop by the side of the road and wander around for a bit and take it all in and snap some pictures of the desert scenery. This was our first full day out in the deserts of Nevada. Awe-inspiring. So peaceful, quiet and absolutely huge. Everything about the landscape out there is so damned majestic and BIG. The sky, the land, the horizon, everything is simply enormous, sprawling, huge, and humbling. We had heard that this strip of road was pretty desolate in that only a small handful of cars drive through it each day. We have reason to believe this is true, for we did not pass one single car during our entire time on the E.T. Highway. Very cool, yet a bit eerie at the same time. After enjoying the serene desert environment for several minutes, we made our way back to the car and headed to Groom Lake Road. It was easy to find. We had maps and information printed from Dreamland Resort as well as Adam's handheld GPS. But the road was easy to spot anyway. It sticks out from the paved highway like a sore thumb. As soon as we turned onto Groom Lake Road, we realized that there was another unmarked dirt road nearby. We noticed this because an unmarked white pick-up with a camper shell left the other road in the opposite direction we were headedà which means it had most likely just come from Area 51. The roughly 13 mile drive down the road that does not technically exist was quite fun and interesting. As most know, Groom Lake Road is a well-kept dirt road that leads from Highway 375 to the Main Gate of the Groom Lake Base (Area 51). During the 15-20 minute drive down the road to the border, we soaked up the atmosphere by driving with the convertible top down and listening to music from the "Close Encounters" soundtrack as well as "The X-Files". It was a total "geek" moment, but very fun. We arrived at the public border to the front gate and stopped just a few feet short of the world-famous warning signs. A "Camou Dude" was already waiting for us. Very cool, yet surreal, to see this ultra-famous site in person. Read the signs on the right and left of the road, and immediately noticed the dark green unmarked SUV watching us from atop the hill that we believe used to be "Freedom Ridge", but was bought by the U.S. government a few years ago. It actually overlooks the base itself, still another 13 miles away from the border, and the government wanted to put an end to all civilian viewing and picture-taking. After a few minutes of sitting in the car and soaking it in, we turned the car off and hopped out to explore what we could of the area (on the public side of the border, of course). We began shooting video and taking photos of the front gate area, then noticed a black military helicopter way off in the distance. We remarked about it, but didn't really pay any attention beyond that. 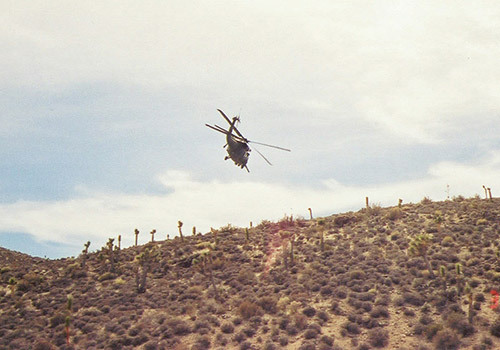 A couple of minutes later, this helicopter literally screamed out from below the north ridge on one side of the road, and dove down on top of us as we stood in the middle of the road. Literally no more that 20 feet above our heads!!!! Jet black, unmarked, military helicopter. It obviously saw us a few minutes prior and decided to come back and purposely buzz us. Armed to the teeth. Absolutely no rotor wash or sand being spit up, but deafeningly loud. Beforehand, it was so quiet that I could actually hear a bird's wings flap as it flew by me overhead. Not a sound. Almost as soon as it appeared, the copter then climbed atop and over the ridge on the South side of the road and disappeared. Each ridge was no more than 30 feet tall. It dove down beyond the ridge, and was gone. We never saw it again. The moment was all at once thrilling, scary, and unbelievable. Adam caught a single photograph of it as it reached the top of the second ridge, just before it dove out of sight for good. An absolutely priceless photograph. Unfortunately, it was so quick that none of us got a photo when it was right on top of us to illustrate just how low and close this thing came. We imagined the "Camou Dude" in the truck and the pilots of the copter all having a laugh at our expense. We also yelled and swore to ourselves about not getting the incident on videotape, having just set the camera down literally a minute or two before. But hoped and prayed that the lone picture would turn out. (It was at this point in the trip that we decided we'd have to start developing our film ASAP during the trip. Waiting until we got home was not an option.) Thankfully, the photograph did turn out. It's cool, but it does not at all convey the magnitude of what happened. After a few minutes decompressing from this unbelievable and exhilarating experience, we packed up and made our way back down Groom Lake Road. Instead of driving all the way back down Groom Lake Rd to Hwy. 375, we decided to cut through "Mailbox Road" to get back to Hwy. 375 and on the way to Rachel. This was quite easy with the notebook of information and Adam's GPS. At the corner of Mailbox Road and 375 sits the infamous "Black Mailbox", which most UFOlogists now know belongs to rancher Steve Medlin and has long since been painted WHITE on re-enforced and padlocked steel to deter vandals and mail thieves. Even though the mailbox has lost some of its mystique over the years, it was still a must-see. We stopped the car and got out for a few moments. It was very strange and eerie to see this mailbox sitting alone, literally in the middle of nowhere. We also remembered that the small gravel area across the street on the other side of Hwy. 375 is reportedly a great site for camping in order to view UFOs and other lights over the base at night. We noted this and pledged to come back out someday and camp in the area in hopes of seeing something. But, it was after lunch time and we were hungry... so we headed to Rachel for a bite to eat. We arrived in Rachel about 15-20 minutes later. Upon arrival, we saw what remained of Glenn Campbell's now-closed Area 51 Research Center. We then headed down the road a bit to The Little A'Le'Inn. Because we were there on a Monday, the place was pretty quiet. We were the only ones there at the time. Quite a neat little place. Really nice group of guys who live in Rachel and run the place. 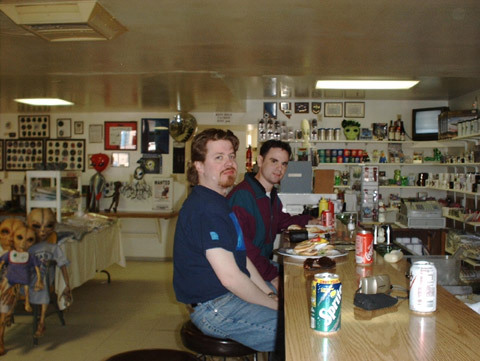 We each had an Alien Burger and took some time to look around the shop at some great merchandise, and look at some of the really great Area 51 and alien/ufo photos on the walls from over the years, all over the world. Some really exceptional stuff. We met Chris, the son-in-law, who helps run the place, and told him of our helicopter experience. He seemed to think that it wasn't a very common experience among visitors to the area. This thrilled us even more, yet made us even more upset that we didn't get any video or better photos. We told him we would send one of the photos of the copter and photos of us in the area to put on the wall of The Little A'Le'Inn. On the way out of the store, we ran into Chuck Clark, one of the premiere Area 51 researchers and authors. He was a great guy. Quite friendly, talkative, and informative. We talked to him for a few minutes and then walked around the immediate area to take some more photographs. While we were walking around the Little A'Le'Inn sign and parking lot taking photos, a jeep pulled up to the restaurant. Out hopped three guys in military gear, British officers that were taking part in the "Red Flag" exercises. After a few more minutes, we got back into the car and drove through the back of Rachel to "Back Gate Road", another dirt road that leads to a newer "back gate" to the base. Because the area is almost all open range, there were many cows and calves lounging about the road. After about 10-15 minutes we arrived at "The Back Gate". Here, the border is much more clearly defined. More than just signs, it consists of a fence, an actual gate, and a guard shack in plain sight. By comparison, the back gate to Area 51 produced an uneventful visit. No helicopters or the like, but some great photos nonetheless. Didn't see anyone at all there, but heard voices inside the guard station on a radio of some kind. Very eerie. We walked around for a few minutes, took more pictures and video and then proceeded back to Highway 375. 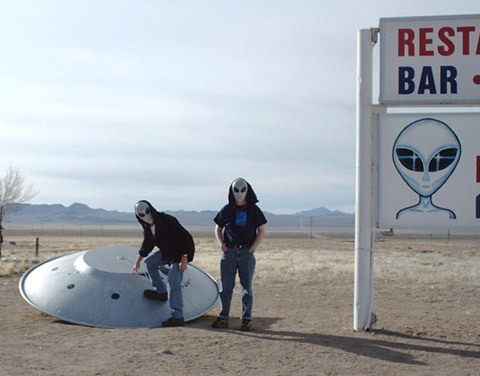 We began our drive out of Rachel and away from Area 51 having spent the entire day in the region. We made our way back to Las Vegas just as the sun was beginning to set on the desert sky. More breathtaking views. Plus, we saw some more Red Flag air maneuvers. All-in-all, it was a very enjoyable and rewarding trek out to Area 51 and Rachel and it will be remembered for a long time to come.